A new generation of canned spritzer is playful yet sophisticated, as producers focus on low-alcohol, lightly sweetened offerings that don’t compromise on good wine. You’ll want one in hand as the weather warms up. Canned wine giant Underwood works with growers from around Oregon. “The products are…not taking themselves too seriously,” says Union Wine Company Founder Ryan Harms. This limited seasonal collaboration with Mei Lin, chef/partner at Nightshade in LA, is made with Riesling, guava, lemongrass, lychee, yuzu, tea, elderflower and almond. Ryan Sharp, winemaker at Portland Sangria, sources all of his ingredients from throughout the Pacific Northwest to create intriguing blends like this fizzy Syrah-based selection flavored with raspberry, loganberry and cardamom. Pampelonne balances creative with classic. 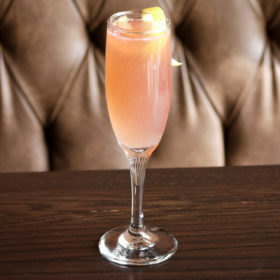 While the brand’s other releases like Watermelon Americano and Harvest Pear Palmetto offer a glimpse, the French 75 delivers all the elderflower, juniper and citrus expected in a made-to-order cocktail. At a modest 6% abv, it’s also inspired for a cookout. This is another classic cocktail turned canned wine spritzer. The peach juice is from Palisade, in Colorado’s Grand Valley. Ben Parsons, the company’s founder/winemaker, says that harvest dates, sugar and acidity parameters are the most important factors to produce quality canned wine spritzers.